1. A normal Saturday slate. Aside from a trio of games in late November, including two on the day after Thanksgiving, every service academy game will be played during a time typically reserved for college football. Last year, Air Force alone played four non-Saturday games. 2. Mids going big time: One-third of Navy’s 12-game schedule will be contested in stadiums that host NFL teams — two games in Baltimore (season-opener vs. Ohio State and season-closer vs. Army), one in Philadelphia (Week 2 vs. Temple) and one in Landover, Maryland, home of the Washington Redskins (Nov. 1 vs. Notre Dame). 3. Home cooking: Navy won’t leave the state of Maryland between its Oct. 11 home game vs. VMI and hosting Georgia Southern on Nov. 15. Army makes the two-hour drive to New Haven, Connecticut, to face Yale on Sept. 27, then has two home games before a trip to Ohio to face Kent State Oct. 18, another home game versus Air Force, and a Nov. 8 trip to Yankee Stadium to face Connecticut. Air Force’s longest homestand is two games and they won’t be easy; the Falcons host Boise State and Navy on back-to-back weeks. 4. Program your remote: At least six of the 14 football weekends leading up to the Army-Navy game will feature multiple service academies squaring off on the CBS family of networks. 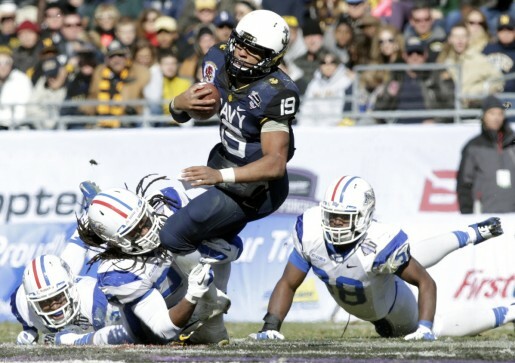 And the Dec. 13 Army-Navy game will be on CBS at 3 p.m., live from Baltimore. 5. Early lines: Even though the schedule’s barely set, the folks at The Golden Nugget already have some wagering information out. Ohio State is favored by 14 points over Navy in the opener for both schools; Notre Dame’s a field-goal favorite over the Mids for early November; and the Black Knights are 13-point underdogs to Navy in their Dec. 13 clash. Navy was a nine-point favorite on the early line last year. Before clicking through to the full schedule, clipping it out and affixing it to the wall next to your television set for optimal Saturday visibility, remember three words that are part of every college football TV slate: Subject to change.